At one point in the 1950s Betty Furness was as ubiquitous on TV as Lucy. Known for her signature hype line, “You can be sure… if it’s Westinghouse.” Furness opened more refrigerator doors then the chef at the Waldorf. Taking advantage of how the former movie actress’s easy-going manner connected with the burgeoning flock of middle-class housewives owning modern appliances for the first time, Westinghouse rushed out this signature thermometer set consisting of a combo candy, icing and deep fat thermometer as well as a roast meat thermometer and skewer. Although she hawked all kinds of Westinghouse appliances, the commercial Furness is best known for she didn’t even do. In one of TVs earliest and most infamous bloopers, the lovely model went to open the frig door but it was locked shut. Although legend has this etched in stone as Betty’s finest moment, she was actually out that day and it was little-known actress June Graham who couldn’t muster up the strength to pop the door. Made by The Chaney Maufacturing Co., Inc of Springfield, Ohio, the box is faded and stained but the thermometers have never been used. 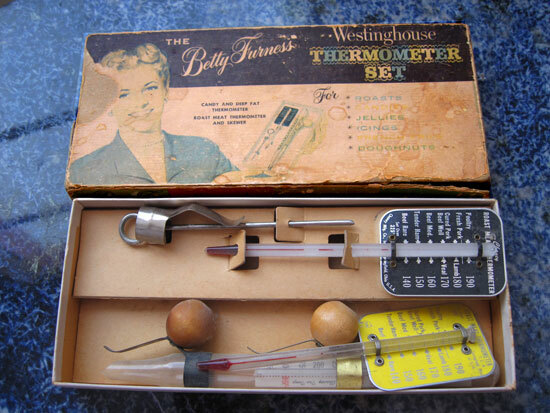 There were so many of these BF Westinghouse Thermometer Sets made that when I first started hitting thrift shops in the 1970s I could count on seeing one in almost every store. 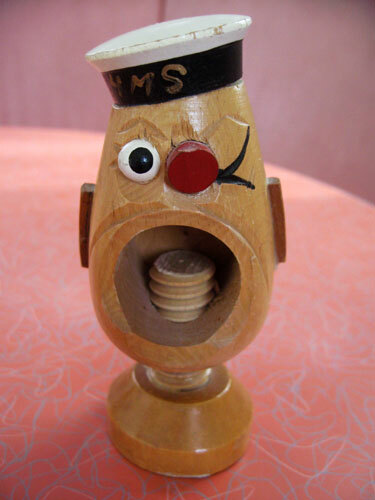 These nutcracker heads were very popular in the 1950s. You hold a nut in the mouth and twist the notched wooden peg that comes through the bottom until it squeezes the nut so tight that shells spew out like machine gun fire. Handy but messy so wear protective goggles while attending to nuts! 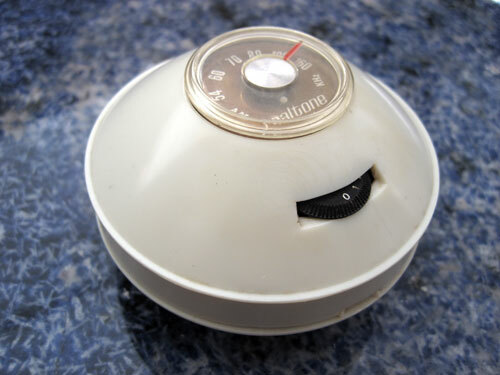 Although just about every transistor radio that was made since they were commercially available in 1954 through the transistorized 1960s was completely gorgeous, the rare ones that were shaped like flying saucers were my favorites. MAde in Hong Kong, this baby is rare as most though most Realtone models bore Space Age names like Galaxy and Electras they came in more traditional rectangular shapes. Made in Hong Kong, this baby still hums like the day it was born. Turn the plastic thumbwheel and music blasts through slits on the bottom as though the soundwaves could propel this spacecraft off the kidney shaped coffee table it most likely was sitting on. One of the first rituals I ever remember doing with total religious fervor was eating my lunch every day with Soupy Sales. “Lunch with Soupy Sales”, his landmark kids show that launched in my hometown, Detroit, in 1953 and ran there exclusively until 1957 when it went nationwide on ABC, was mandatory noon viewing accompanied by my staple of one half peanut butter and jelly and one half tuna sandwich with a large glass of Sealtest milk spiked with several hits of Bosco. Though it doesn’t seem like quite the appropriate material for a dress commemorating a lasting holy union there’s no disputing the price is right! Made entirely of toilet paper, tape and glue, I think these gowns are fabulous and the concept of buying the makings of your wedding dress at Costco is brilliant. I mean it. I’ve never understood anyone blowing the entire wad on a dress they’ll wear once, flowers and chopped liver swans and then living in squalor with only a photo album and four fondue pots to remind them of the one day that life was so entirely good. I’d so much rather spring for a few hundred rolls of toilet paper, which probably leaves much to spare after the gown is glued, then end up using toilet paper for napkins the rest of my life because all the coin went into the dress that you’re probably already too fat to fit back into. 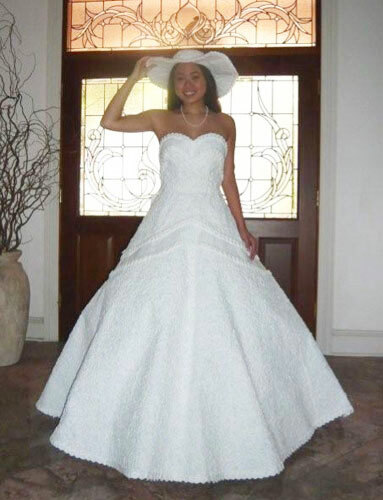 This brilliant Toilet Paper Wedding Dress Contest is sponsored every year by cheap-chic-weddings.com of Boca Raton, Fl. 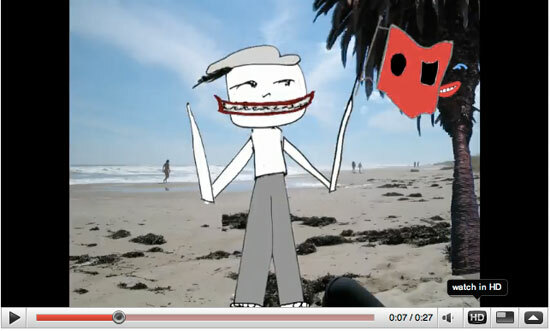 Although the 2009 first-place winner was Ann Kagawa Lee of Honolulu, Hawaii, pictured above, my favorite is second place winner, Terri Glover of Marlin, Texas, because of all the little toilet paper points sticking out that probably rippled in the breeze as she walked down the aisle. Though it doesn’t seem like quite the appropriate material for a dress commemorating a lasting holy union there’s no disputing the price is right! Made entirely of toilet paper, tape and glue, I think these gowns are fabulous and the concept of buying the makings of your wedding dress at Costco is brilliant. I mean it. I’ve never understood anyone blowing the entire wad on a dress they’ll wear once, along with flowers and a chopped liver swan and then living in squalor with only a photo album and four fondue pots to remind them of the one day that life was so entirely good. I’d so much rather spring for a few hundred rolls of toilet paper, which probably leaves much to spare after the gown is glued, then end up using toilet paper for napkins the rest of my life because all the coin went into the dress that you’re probably already too fat to fit back into. 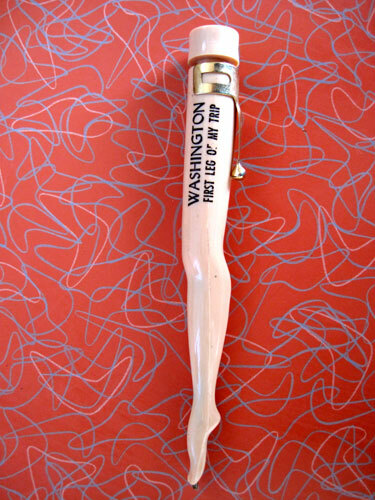 I love pens in the shape of things but none more so than this souvenir writing implement from Washington made of plastic in the 1950′s. I don’t know if it’s the first leg or only leg of the trip but the shape of the foot is so perfect to end in a pen point. Although I can’t remember where it was from, either Washington DC or Florida, I had one of these as a kid and loved using it so much I credit it with being part of the reason I became a writer. 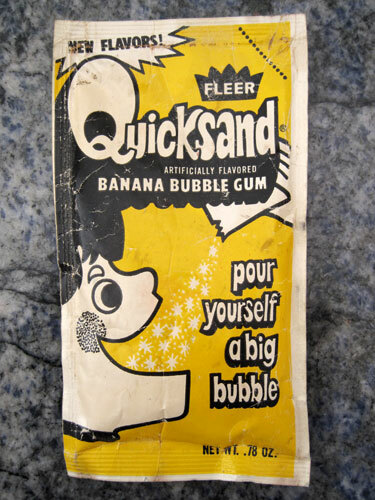 Made in the 1970′s, Fleer Quicksand Bubblegum also came in Strawberry and Sour Apple. I never had the guts to pour this down my throat so not sure how it worked but the concept of powder turning into bubblegum is Kitsch enough for me. Yuck and fabulous in one fell gulp! Giving equal time today to Dr. Ben Casey as yesterday was Dr. Kildare’s day. Ben Casey was actually my first love. 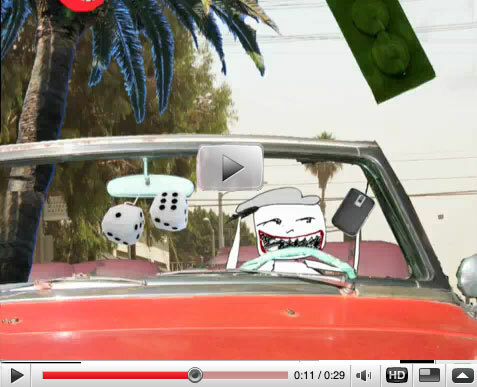 I swooned over his swarthy, dark looks and, truth be told, collected more Casey than Kildare. 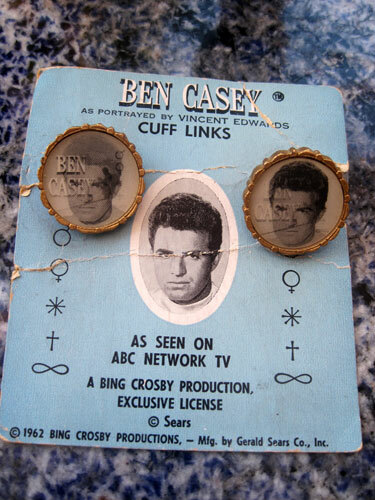 Although I acquired this actual pair of 3D lenticular “Ben Casey As Portrayed By Vincent Edwards Cuff Links” at Chic-A-Boom in Hollywood in 1980, I did actually have this exact pair as a kid. They went to school with me almost every day as I became fanatic about wearing blouses with long sleeves and cufflinks holes just so I could have Dr. Casey with me. These “As seen on ABC Network TV” cufflinks were made by Bing Crosby Productions exclusively for Sears. Gerald Sears Sales Promotion Service, not THE Sears, in 1962.